Okay, just to be clear, I don’t only make cakes at home. Although, wouldn’t that be nice? All cakes all the time? But seriously…as you all know, I love to bake and I love to share my favorites with anyone who will enjoy them as much as I do. 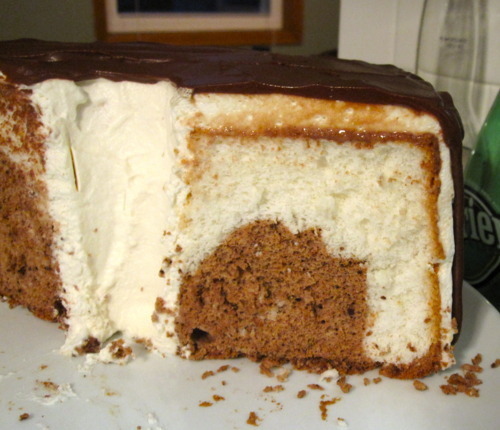 Today’s featured cake: the Chocolate and Vanilla Angel Food Cake. Otherwise known as: the best of both worlds. I have this friend who, for as long as I’ve been baking cakes, has been eating the cakes. He’s never complained, never once steered me toward pies, tarts, or turnovers. Whenever we get together for our dinner parties, he’s always accepted cake as the dessert du jour. He’s taken a slice, added some ice cream, and ate without saying a word. However, one day I happened to find myself perusing a certain restaurant review website, and lo and behold, what do I find? But a review written by my friend in which he states explicitly, “I hate cake.” He wrote those words. I. Hate. Cake. Glossy and gorgeous egg whites, whipped to perfection. Folding in the cake flour/sugar mixture. Okay, so, I may have made up that last part. But he did say that historically speaking, the cakes I’ve baked have always managed to be soft and unlike most of those he “hates.” I’ll take that as a compliment. Definitely. He doesn’t hate my cakes. He just hates all the others. Adding cacao powder to remaining whites. Baked and cooling on a parchment-lined cake stand. Completing the “chocolate drip” layer. Preheat oven to 325ºF. Sift together cake flour and 3/4 cup sugar. 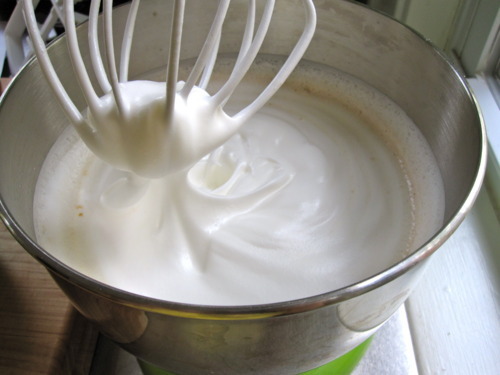 Using stand mixer and wire attachment, begin mixing egg whites and cream of tartar on low for one minute. Add salt. Increase speed to medium-high and mix until egg whites are thick and billowy. With mixer running, slowly pour the remaining 3/4 cup of sugar down the side of the bowl. 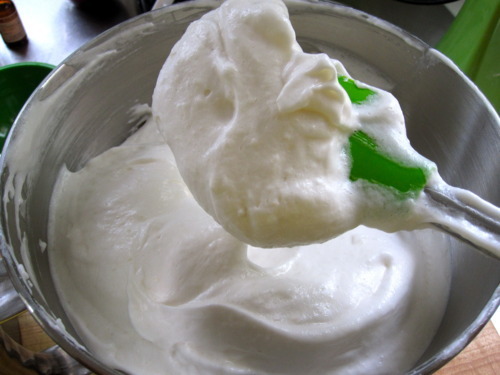 Continue beating egg whites until glossy and soft peaks gently tip over when you pull the beater up. Add extracts and turn the mixer on for a couple of seconds to incorporate. Stop mixer. Remove bowl from mixer. Use your largest rubber spatula to delicately and carefully fold sifted flour and sugar into whipped egg whites. Add about 1/4 cup of flour/sugar mixture at a time. To fold: Slice with spatula perpendicular to whites down to bottom of bowl and turn spatula slightly to pull up batter from the bottom and lay over the top. Turn the bowl 1/4 turn and repeat slice with spatula until flour and egg whites are just mixed. Have patience and use a light hand when folding. You don’t want to deflate your egg whites! 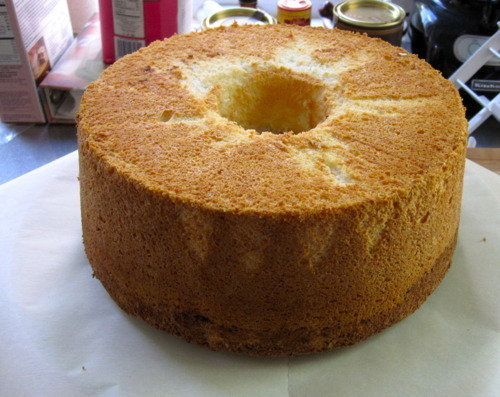 Pour more than slightly half of batter into an ungreased angel food cake pan with removable bottom (a.k.a tube pan). Use a spoon to draw a trough around the middle. 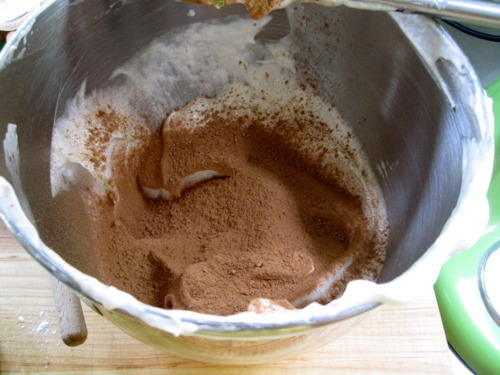 Carefully fold sifted cacao powder into remaining batter until completely mixed. 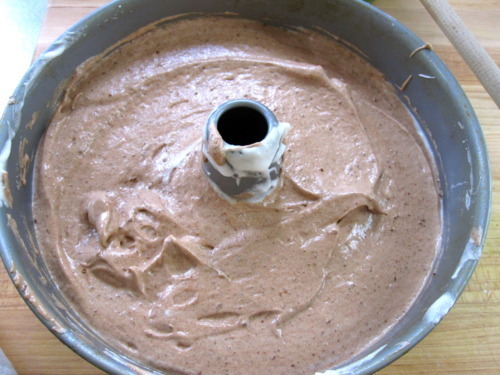 Fill trough with chocolate batter and smooth over the top. Bake for 50-55 minutes (my oven required only 50 minutes). Remove from oven and immediately turn over to cool for several hours, or overnight. Use a firm hand and a skinny knife to loosen cake from edges of pan. 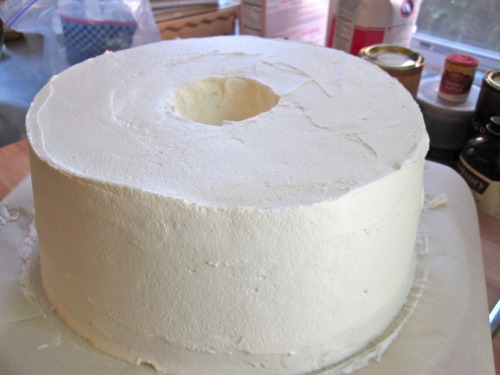 Invert cake onto a parchment-lined cake stand. Put chocolate chunks into a small glass bowl. Heat heavy cream just to a simmer and pour over chocolate. Let sit for at least a minute, then whisk together until chocolate is smooth. Let cool to thicken. Whip heavy cream in a chilled bowl with whisk attachment. 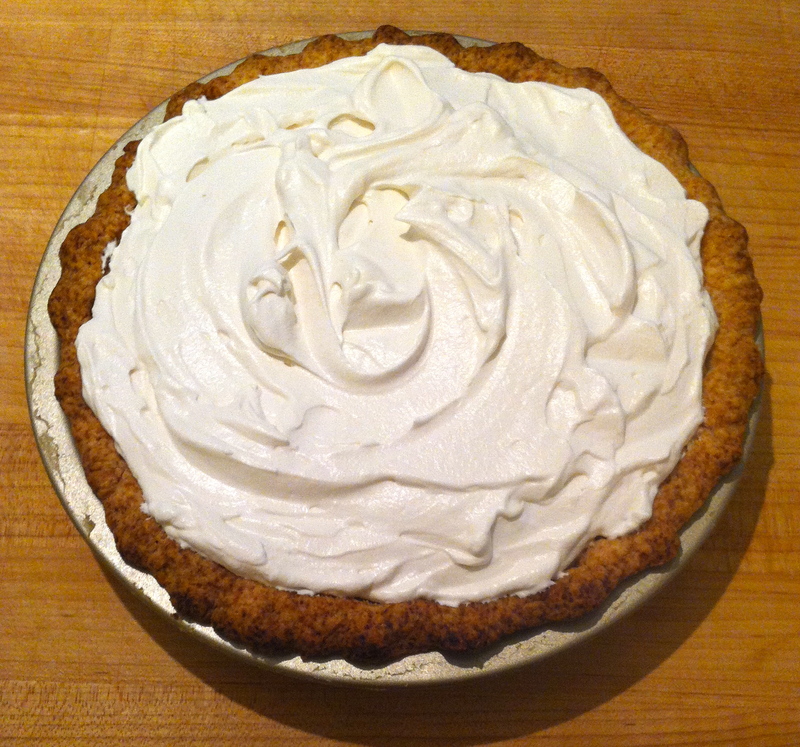 When thick with soft peaks, add powdered sugar and extract and continue to whip until cream makes stiff peaks. Be careful not to over-whip, as you might end up with butter! Yikes! 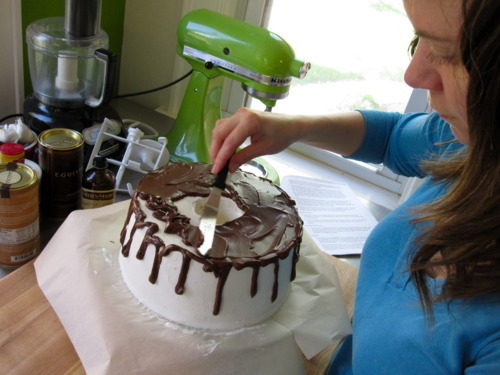 Spread icing smoothly over angel food cake using offset spatula. Chill in fridge for 15 minutes. Pour chocolate mixture into plastic food storage bag or piping bag, if you have one. If it’s too thick to make nice “runs” down the side of your cake (or practice on an inverted bowl if you want), add a few drops of warm cream. If too thin, let cool awhile longer. 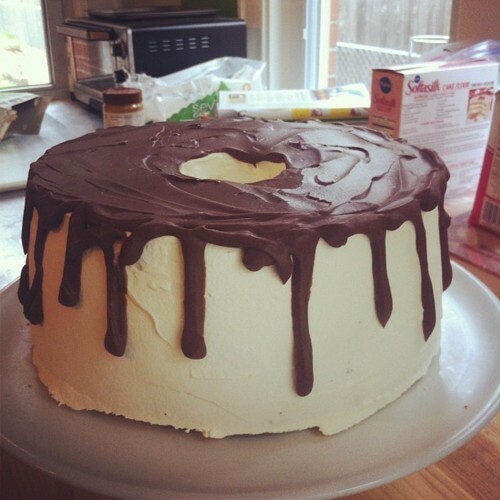 Run ganache along the upper/outer edge of cake and slowly squirt ganache from small hole in food storage bag (or from tip in pastry bag) making “runs and drips” around entire cake. Don’t stress if it’s not perfect. It’ll be just fine. It’s cake, after all. Squirt remainder of ganache on top of cake and spread out using offset spatula. 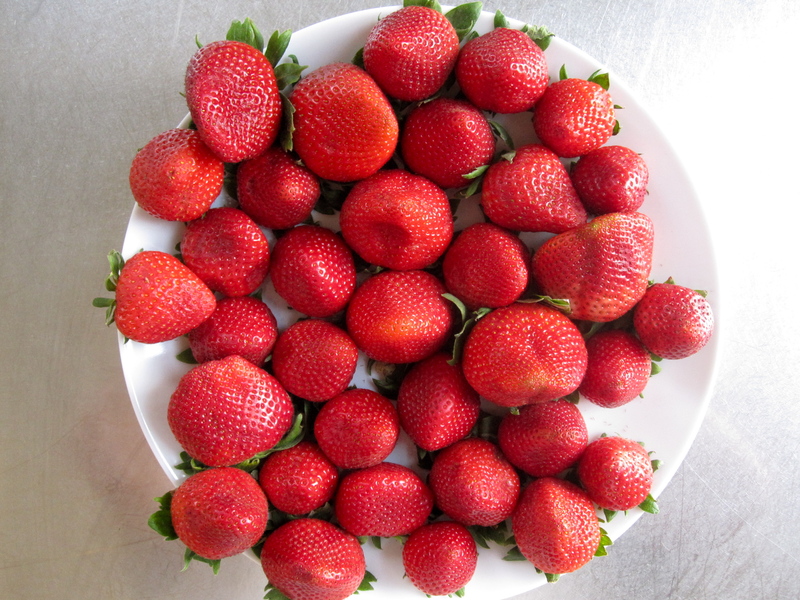 Chill at least one hour in refrigerator. Best eaten within 24 hours. Store remaining cake (if there is any) in the fridge. **If you don’t have cake flour, measure 1 tablespoon of cornstarch into a 1 cup dry measuring cup and fill with all-purpose flour. Sift into small bowl. It won’t rise as much, but it will work in a pinch.